This paper is a narrative on the positive impacts of a women farmer-adoption programme by Regional Sericultural Research Station, Jammu, India. A total of 60 women were adopted for empowerment by way of giving them opportunity to have additional income from sericulture in Kandi area of Jammu, Northern India. The adopted women harvested on an average 45 kg cocoon per 100Dfl’s and earned up to Rs.8330 from silkworm rearing in spring season. The researchers claim that the result of the adoption project is indicative of the positive impact of training; towards better adoption of sericulture technologies among women sericulturists. Silk is the most elegant textile in the world with unparalleled grandeur, natural sheen, and inherent affinity for dyes, high absorbance, light weight, soft touch and high durability and known as the “Queen of Textiles”. Sericuture, the art and science of silk production is a livelihood opportunity for millions owing to its high employment generation potential, low capital intensive nature, while being a highly remunerative agro industry. The very nature of this industry with its rural based on-farm and off-farm activities and enormous employment generation potential has attracted the attention of the planners and policy makers to recognize the industry among one of the most appropriate avenues for socio-economic development of a largely agrarian economy like India. Today, mulberry is cultivated in about 0.192 million hectares in India. Around 6 million people from around 800,000 farm families are engaged in sericulture activities, concentrated mainly in the three southern states of Karnataka, Andhra Pradesh, and Tamil Nadu. The Silk Production Statistics estimated the world silk production to be 152868 metric tonnes. China’s contribution to world silk production is 126000 metric tonnes, and the share of Indian silk production is 23,679 tonnes metric tonnes (CSB, 2013).China and India together account for 97.9% of world silk production. The adoption level of improved technologies of mulberry cultivation and silkworm rearing is very low among J & K farmers. The major constraints are lack of awareness followed by traditional practices. Expensive and cumbersome technologies, lack of awareness, and non-availability of technology are attributed as the major reasons for non-adoption (Qadri et al.2010). Creating awareness and interest among farmers about latest technologies and development of farmer-friendly and cost-effective technologies are needed. No wonder women are playing a very important role in the sericulture industry. It is seen that the sericulture activity brings regular income to the community without any bias of caste, creed, gender, or religion. As woman have crucial role in the activities of sericulture, it equally creates opportunities and makes them independent socially, economically and politically. It is a well known fact that poverty affects mostly women. 60% of the world’s hungry are women. Women work two-third of the world’s working hours, produce half of the world’s food, but earn only 10% of the world’s income and own less than one per cent of the world’s property. The gender target therefore needs to be bold and strong, moving away from measuring average progress towards focusing on the marginalized groups, such as women living in fragile area. The submontane tract lying in the outer Himalayas of Jammu division of Jammu and Kashmir is locally termed as Kandi belt. Most of the terrain of Kandi is undulated and affected by vagaries of unpredictable weather further aggravated to prolonged dry spell. Moreover, marginal size of holding also adds to the worries of the farmers. In such conditions, something which provides sustainability is the use of traditional knowledge-wisdom developed by the people over many generations. 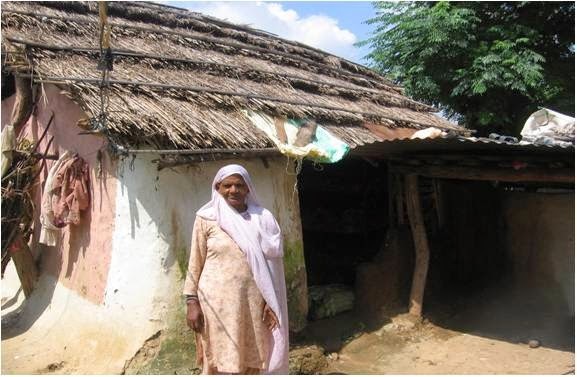 In Kandi belt of Jammu, women livelihoods mainly depend on rainfed maize and wheat crops. Owing to continuous research and improvement in recent years, sericulture has established its superiority over other principal crops. Employment opportunities in sericulture can be categorized under two heads; viz. opportunities related to mulberry cultivation and silkworm rearing and opportunities relating to silk reeling, twisting, weaving, and marketing. The latter is mostly undertaken in semi urban and urban areas. In the present work it was aimed to empower women of Kandi belt of Jammu through sericulture (mulberry cultivation and silkworm rearing). From the female headed families, a total of 60 women were identified by selecting 20 in each Research Extension Center, operating in Kandi belt of Jammu region. Data on family size and structure, land holding, occupation, cast-wise distribution, monthly income, daily expenses, educational status and participation of men, women and children in silkworm rearing practices were recorded. An assessment was made of their level of knowledge and current level of livelihood. Insect pests and diseases of mulberry and their control measures. 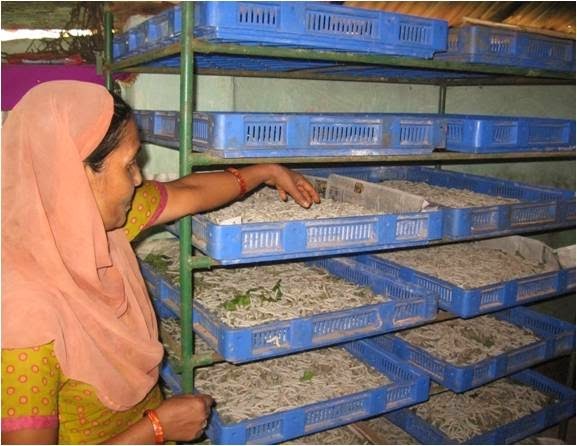 Demonstrations of silkworm rearing and plantation were carried in the field area of women participants. Thereafter, Chawki reared worms were given to women and cocoon yields were recorded and marketing data was collected. Impact of the peripatetic training was assessed and compared by the analysis of variance. 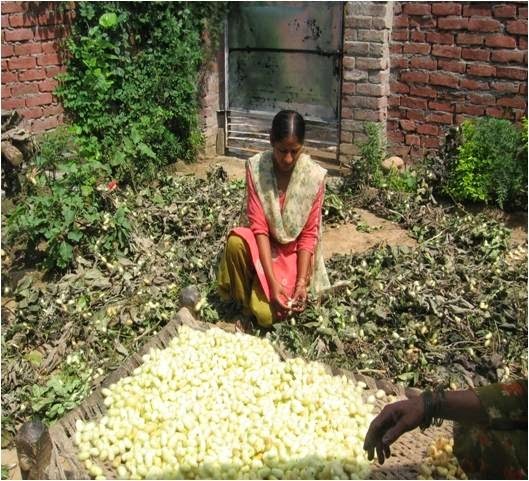 The cumulative effect of peripatetic training was monitored by observing cocoon yield, price per kilogram of dry cocoons and income from sericulture of the adopted women in the present work. It can be seen from Table I that the average yield of cocoons per 100Dfl’s increased from the first year of 37 kg in 2011 to 45 kg in 2013. In Tikri area, the gain was substantial, where average cocoon yield per 100 Dfl’s increased upto 46.89 in 2012 from 29.58 in 2011 and 41.14 kg in 2013. However, the difference in cocoon yield between 2012 and 2013 were not significant in Tikri area. In Barnoti, the cocoon yield increased from 36.44 kg in 2011 to 41.49 kg in 2012 and 48.99 kg in 2013. 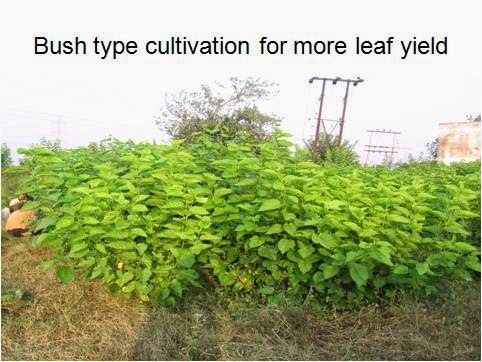 The cocoon yield in Naushera could not be improved beyond 45 kg per 100Dfl’s during the present work. It can be seen from Table II that the average cocoon price of the adopted women in Jammu increased from Rs. 360 to Rs. 585 per kilogram. However, in Tikri area, the gain was more than double, where the cocoon price increased from Rs 329 in 2011 to Rs.711 per kg in 2013. In Naushera, the cocoon price increased from Rs. 296 in 2011 to Rs. 529 per kg in 2013. And, in Barnoti, the cocoon price increased from Rs. 456 in 2011 to Rs. 517 in 2013. 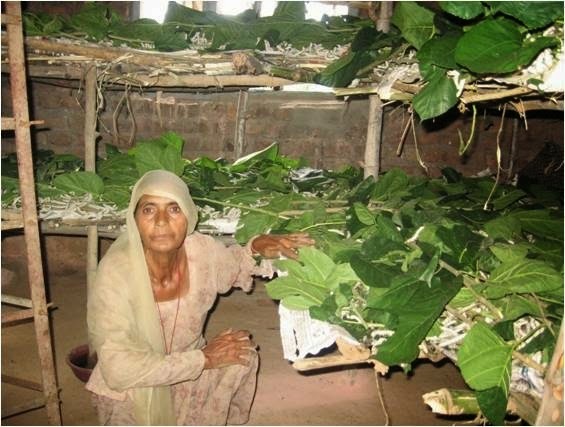 The average income of the adopted women from sericulture per crop increased from Rs. 3910 in 2011 to Rs. 8330 in 2013. 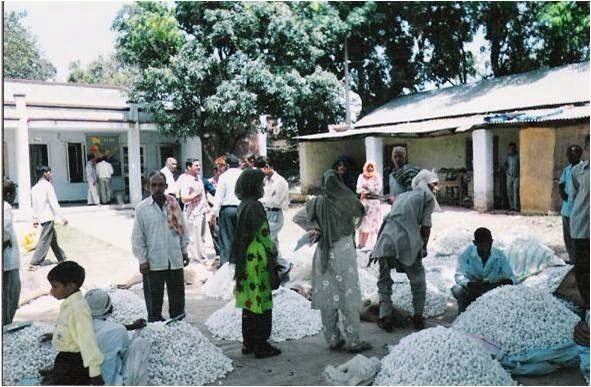 In Tikri, the average income from sericulture increased nearly three times from Rs. 3098 in 2011 to Rs. 9593 in 2013. In Naushera, the income from sale of cocoons increased from Rs. 3552 in 2011 to Rs. 8079 in 2013. And in Barnoti, the income increased from Rs. 5082 in 2011 to Rs. 7320. Sericulture technologies demonstrated to adopted women in the fragile Kandi belt of Jammu province during peripatetic training led to 39.14% increase in cocoon yield and 34.54% increase in Barnoti area. In Naushera area, the women harvested 45kg per 100 Dfl’S (40000 eggs) in the first year of the project itself and improvement beyond 45 kg could not be achieved during the project period due to the fragility of the area, being very close to Pakistan border. The average yield of cocoons per 100Dfl’S increased from the bench mark of 37.04 kg in 2011 to 45.34 kg in 2013 due to training impact. However, due to general price hike in the market, during the year2013, the income of the women from sericulture increased by 209.78% in Tikri, by 127.49% in Naushera and by 44.03% in Barnoti area. It is inferred that the new technologies of sericulture should be popularized by peripatetic training programme. Awareness programme should also be conducted during the field activity as per the need of the season for improving the bivoltine cocoon production. ADOPTION OF IMPROVED SERICULTURAL PRACTICES BY SERICULTURISTS IN BORDER AREA OF KASHMIR.